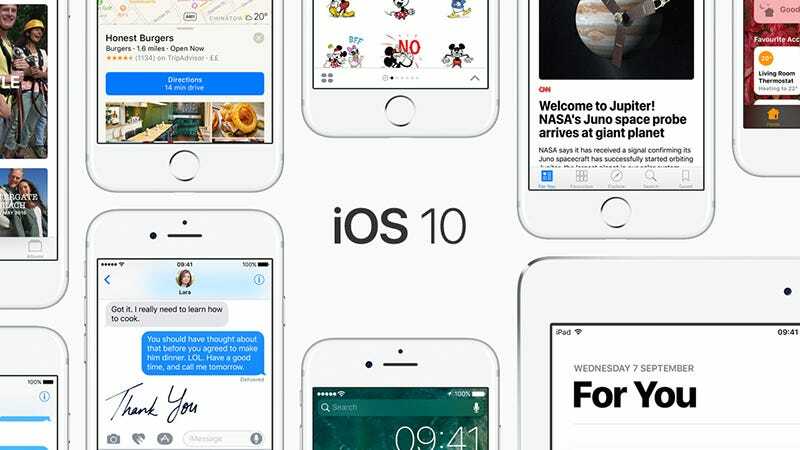 iOS 10 is live and amongst us and packed with a range of brand new features to play around with, but it’s not without its problems either. If your iOS 10 experience has been less than ideal, here are some of the problems you might be seeing—and how to fix them. First of all though, update your software. Apple is busy squashing bugs and patching problems all the time, so a simple iOS upgrade might be enough to get your phone or tablet working properly again. Just head to the Settings app and tap General then Software Update to check for a new iOS version. The same goes for individual app updates as developers roll out patches for their apps. If you’re still having issues after that, read on. A quick toggle of the switch for Wi-Fi, Bluetooth, or cellular data to off and then back on again can sometimes work wonders, so try that if you haven’t already. Beyond that, resetting the network configuration in iOS is usually a good way of clearing up any issues. You’ll need to reconnect to wi-fi and your other devices, but the process clears out any broken settings or bad data that’s preventing you from getting hooked up. Go to the Bluetooth menu inside Settings and tap the info button next to any device to “forget” it; you can do the same through the wi-fi menu. Reconnecting to these devices and networks from scratch might be enough to solve the problem. There is a more comprehensive reset option which you can find under the Reset menu in General in Settings. Tap Reset Network Settings to clear out everything at once. There haven’t been widespread reports of iOS 10 doing much to damage battery life, but you might be seeing more of a drain, particularly on older devices where the battery is slowly degrading over time anyway. As this isn’t a particularly iOS 10-specific issue, nor are the fixes: all the general battery-saving tricks are your best bet here. They including dimming the brightness on your iDevice’s screen and reducing the time before the screen locks (both in Display & Brightness in Settings), making use of Airplane Mode when you’re in a place with sketchy signal, and turning on the Low Power Mode feature Apple recently added to iOS (in Battery in Settings). Cutting down the list of apps in the Background App Refresh list in General in Settings can help, as can uninstalling apps you’re not really making much use of anyway—they can’t drain the battery in the background if they’re not installed. iMessage received a big update alongside iOS 10 and we’ve seen scattered reports on the web that one or two bugs are cropping up in this app in particular. One strange one is where the special inline animations (like fireworks and invisible ink) don’t work, and apparently, this is due to an obscure setting in the Accessibility menu under General in Settings. Tap Reduce Motion and make sure it’s switched off. Some users have come across problems sending messages in Messages in iOS 10. The best fix seems to be a full reboot of the device, or failing that deleting the messages or conversation that’s proving problematic (press and hold on a message, then tap More to see the trash can and Delete all options). Resetting network settings, as we described above, is another way of troubleshooting issues you’re having with iMessage and the Messages app. A number of users have experienced problems with Touch ID after updating to iOS 10, with fingerprints not being recognized and various other bugs. The fix isn’t a particularly difficult one: as with your networks, you need to start again from scratch. Under the Touch ID & Passcode menu in Settings, tap on your stored fingerprints and delete them, then add them again (assuming you still have the same hands). If that doesn’t work then you might have to try something more drastic. Turn Touch ID off completely using the toggle switches at the top of the Touch ID & Passcode screen, then reboot your iPhone or iPad, and try turning Touch ID back on again. If you’re having problems with iOS 10 crashing or not starting at all, or you’ve come across a stubborn bug that you can’t shift, you can use iTunes on a Windows or Mac machine to install a clean version of iOS. This should wipe away the majority of problems you’re having (it essentially gives your device a clean slate to start again). Update iTunes to the latest version, plug in your iPhone or iPad, and then launch the software. Apple has a full guide to the process but you need to hold down the Sleep/Wake and Home buttons (or the Sleep/Wake and Volume Down buttons on the latest iPhones) until you see the recovery screen. Choose Update from the dialog that pops up and iTunes will try and install iOS 10 again without erasing any of your data; if it doesn’t work, a full restore might be required, in which case you’ll need to have backups safely stored somewhere if you want to get your photos, music, and other stuff back. You can also choose the Erase All Content and Settings option from within the Reset menu under General in Settings on the device itself. This takes everything back to the beginning, erasing all your personal data in the process, so again you need to make sure everything important is backed up in iCloud, iTunes, or somewhere else. If a factory reset doesn’t solve your problem you might be looking at a hardware issue or a bug Apple needs to fix. If you report the issue on the Apple Support Communities portal then the company might heed your complaint, especially if other users are experiencing the same sort of difficulties.